Chester Football Club – Official Website » SQUADBUILDER | BuyCleverStuff with superb Blues incentive! SQUADBUILDER | BuyCleverStuff with superb Blues incentive! Local business BuyCleverStuff have set up a very special offer to aid Bern and Jonno’s Squadbuilder fund. 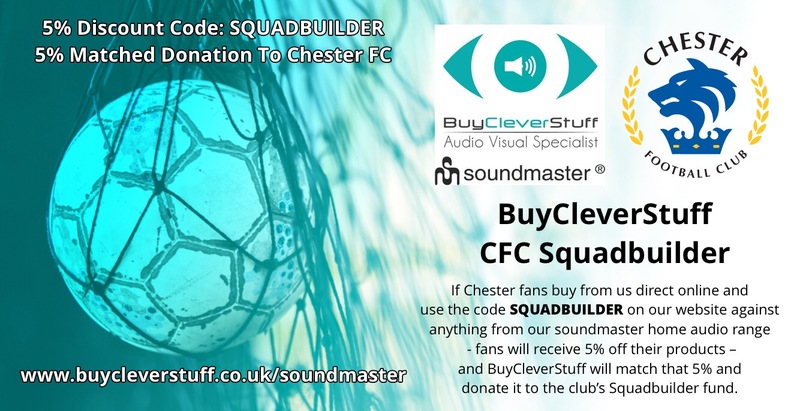 If Chester fans buy from Buy Clever Stuff direct online and use the code SQUADBUILDER on their website – against anything from their soundmaster home audio range, they will receive 5% off their products – and then BuyCleverStuff will match that 5% and donate it to the club’s Squadbuilder fund. It means the fans get great products – and the club gets additional support. For all your audio and visual needs, visit their website and make a difference to the club at the same time! This offer runs until 3st May 2019. CLICK HERE TO VISIT THE BUY CLEVER STUFF WEBSITE – thanks for your support, BuyCleverStuff! In the last six months, BuyCleverStuff has been fortunate enough to garner a fantastic relationship with Chester FC. As a company, we’ve been in business since 2006 and have quickly become one of the country’s biggest online audio visual specialists catering to the general public when it comes to home audio visual equipment. When the flood damage occurred, whilst slightly outside of our normal day-to-day business, we were only to happy to advise and then agree to carry out the task of supplying the new PA system which was vital – alongside the CCTV system from Jackson Fire & Security – to the staging of fixtures. You may have seen our involvement in the Retro Day game against Darlington FC, both in the lead-up and on the day itself, where we gave away some fantastic retro-style audio products from our soundmaster home audio range. It got us thinking though – what more can we do as a local business to help Chester FC? The fantastic online initiative from the Chester FC Community Trust where you can buy on Amazon via “Amazon Smile” means a small donation is made to the wonderful work of the Community Trust. As we head into a busy Christmas period, we thought we’d do something similar through our own website, but to directly affect the work on the pitch. 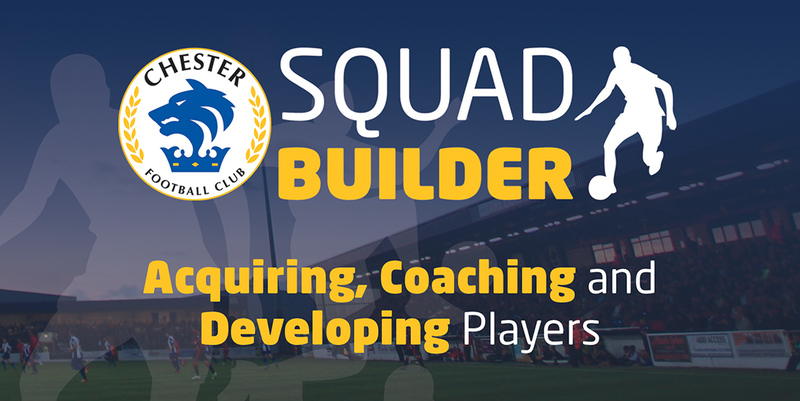 Which is why we are launching for the next six months, our commitment to Chester FC with our plans to support the Squadbuilder. 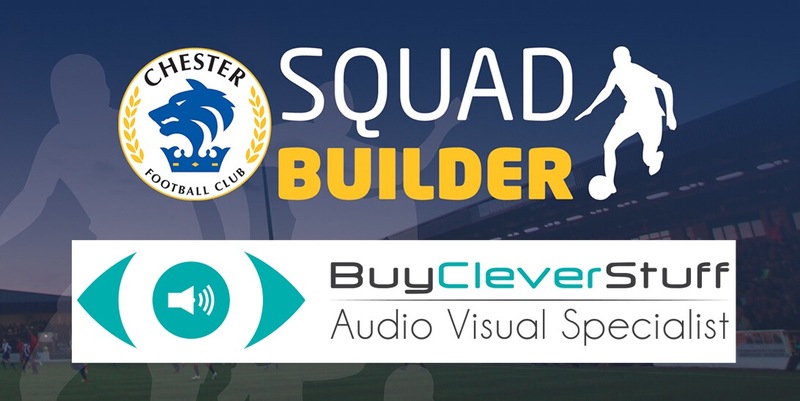 If Chester fans buy from us direct online and use the code SQUADBUILDER on our website when checking out – against anything from our soundmaster home audio range – fans will receive 5% off their products – and we here at BuyCleverStuff will match that 5% and donate it to the club’s Squadbuilder fund on a monthly basis. It means the fans get great products, great for Christmas and other occasions such as birthdays, wedding presents and such – with the team on the pitch also seeing the benefit. Whilst our presence stretches across the country and into Europe, we’re still based in Chester and are proud to support the community ethos and fan-ownership of Chester FC and hope this goes a long way to helping support the team for the rest of the season! BUYCLEVERSTUFF | Fanastic new Squadbuilder offer by Blues Media Sponsors!